Space to Grow Chicago is a unique partnership between Openlands and Healthy Schools Campaign that works to create places for students to engage in physical activity before and after school. These schoolyards are built with specific materials, surfaces, and techniques to manage and retain stormwater, capture pollutants, and mitigate flooding in the neighborhood. To achieve these goals, Space to Grow partners with the Chicago Department of Water Management and the Metropolitan Water Reclamation District of Greater Chicago. Space to Grow also recognizes the importance of making community members the owners and drivers of such an initiative. They place a strong emphasis on including community members in the planning, building, and maintenance processes of the project. This organization is a leader in serving underserved students in the Chicago Public School system. These students experience chronic illnesses such as asthma, diabetes and obesity at much higher rates than their peers. In addition, more than 86 percent of the students are considered economically disadvantaged, which often makes nutritional and physical wellness a second priority. Thus, school wellness is a key strategy for addressing health disparities and ensuring all children have the opportunity to learn and achieve their potential. Chicago has long since faced challenges with water quality and stormwater management. At least 40 percent of the city is covered by impermeable surfaces, leading to combined sewer overflows, neighborhood flooding, and degradation of water resources. Climate change threatens to worsen the problem, as storms show a trend towards increasing intensity and frequency. Space to Grow is committed to using green infrastructure in their schoolyards to absorb large amounts of water and divert runoff from overtaxed sewer pipes. These features can ultimately become a part of the region’s overall approach to stormwater management. To ensure that their work is impactful and having the desired effect, Space to Grow partners with various research institutions to carry out studies evaluating various aspects of the projects. For example, Conservative Design Forum and the US Geological Survey are both in the process of monitoring the volume of rainwater capture and the quality of runoff from schoolyards. Early results from the survey are promising; for example, Grissom Elementary is projected to retain and remove 100 percent of pollutants from 99 percent of all storms. So far, Space to Grow has served 9 schools, with 34 more slated for 2019. 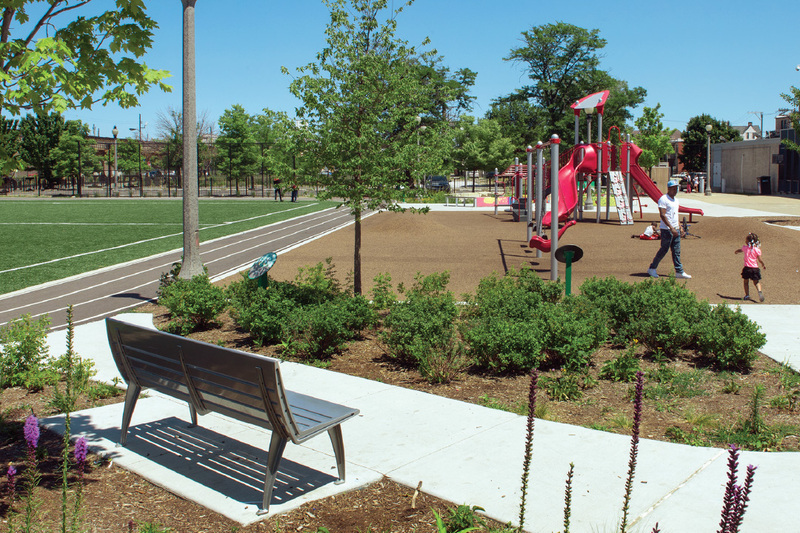 The organization is committed to an inclusive planning process, during which school staff, students, parents, and other community members provide a vision for their schoolyard. Schoolyards are then designed and constructed based on the unique needs and ideas of a community. 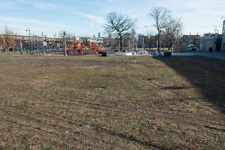 To ensure that these schoolyards encourage social interactions, better physical health, better learning, and community gathering, the organization enlists the help of The Consortium to Lower Obesity in Chicago Children. CLOCC found in a pilot study of two schools that students of all grade levels are overwhelmingly more active after implementation of the schoolyards. Teachers, parents, and principles all report that students have more opportunities to be physically active and bolster social-emotional health through play. Even after the completion of the project, community members note more social cohesion as they now have a space to meet, relax, and exercise with other community members.